What is the "right" way to raise your child? Tena Koutou. When it comes to raising children, there are a million and one ways how this can be done. This is okay if, as a couple, you both agree on a certain parenting style, but what happens when this is not the case? And quite often this will happen as individuals are raised within different family environments, coming from diverse cultures with differences in their belief and value systems. This will raise certain conflicts between new parents and will need to be addressed, the moment the issue arises. So, down to the big question of how a couple may begin to discuss this issue together... Although it would be great if these conversations took place between a couple before they have children, it rarely happens, as these differences only become obvious once the children arrive. So here are some basic ideas that you may want to consider when discussing how you would like to raise your children. What will the religious beliefs of the family be? What culture do you want your children to be raised in, particularly if both parents are from different cultures? What are your ideas around discipline? Are the family responsibilities to be shared, and if so, what might you expect of each other in these roles? What are your beliefs around what a Mum's role is and what a Dad's role is? Is education important? How might you celebrate birthdays, Christmas, Easter, etc - were these important to you when you grew up? Was open communication valued when you grew up or were children supposed to be seen and not heard? I could be here all day as the list goes on, but no doubt you are getting the idea of what I'm encouraging you to explore. And this doesn't just pertain to new parents; this discussion could also be helpful if your present whanau unit is in conflict over differences in parenting styles. You may have always been aware that there was a problem and over the years this issue may have grown. This can happen when children begin moving into new developmental ages and stages, particularly the teenage years. Whatever your answers may be to the questions above, neither of you are wrong in having your own personal beliefs, you just have different ideas and opinions, based on your own personal life journey and experiences. So instead of taking the win / lose stand, it's important to share your views and try to create a solid framework of beliefs and values that will work for your whanau. What I will add here, though, is that if, within your discussion, you learn that your partner is okay with using violence as a way to raise children, this is not okay and it would be important to seek support and talk to somebody about it. Parentline can offer support to parents by way of the different programmes we offer and the one-to-one counselling service we provide. 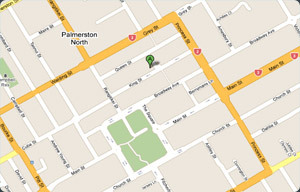 You can either drop in and see us or you can contact us on 355 1655. As spring descends on us all, bringing about the space for new beginnings and new growth, and leaving behind the dullness of winter, I hope this finds you all well and enjoying this welcome change. There is a season for everything, and if this column has spurred you, just a little, to seek positive change for your whanau, now would be a great time to do that.